The term trans-fat might as well be short for transformed fat. And transformed fats have no place in your body. While the term “trans” refers to the specific bond of carbon atoms, it is all too coincidental that this bond is often artificially created by scientists in laboratories when they partially hydrogenate liquid oils to make them solid so they can withstand longer shelf lives. Saturated fats are more tolerant to heat treatment than mono- and poly-unsaturated fats, so if you’re thinking of cooking something, it’s best to use butter or coconut oil to avoid minimize the creation of trans-fats. And don’t be fooled by restaurants that boast “trans-fat free” signs. As soon as their “trans-fat free” oil is heated, it has become trans-formed! Canola Oil – After you read this, you’ll be emptying your cupboards! How often do you use vegetable oil? When you bake, when you fry…every day? If you frequently use these seemingly “healthy” oils, then you need to read on. Supermarket oils are highly processed. First, they are refined using sodium hydroxide (think Draino) to remove “impurities”. They are then treated with phosphoric acid (think Windex) to de-gum; which removes lecithin, chlorophyll, calcium, magnesium, copper, and iron. To make it look appealing, it is bleached to remove pigments, which turns the oil rancid. Colour is added later because clear oil does not look natural. It is then heated above 220˚F to remove any odour, which creates monster trans-fat molecules that will eventually become part of your body! Then you take it home and heat it again in your frying pan, mutating the molecules even more. We must start thinking of the quality of every morsel we put into our bodies. There is a huge difference in quality between canola oil and cold-pressed extra virgin olive oil. Olive oil is not heat treated, and extra virgin means the oil was obtained from the olives’ first pressing. Cancer is linked to processed vegetable fats. This includes hydrogenated shortening and margarine. Margarine is a synthetic, man-made chemical, alien to our bodies. Hard stick margarine is loaded with trans-fats. Hydrogen is forced into vegetable oil to turn it into a saturated fat, solid at room temperature. Hydrogenation changes the shape of oils at the molecular level, and the shape of a molecule s extremely important. Think of your body like a moving jigsaw puzzle. The billions of processes that occur every second are all little parts and pieces of your body puzzle. If any piece has been altered in any way, it will not be able to fit in where it should…and could even fit in places it shouldn’t! Newer margarine is made from vegetable oil and modified palm and palm kernel oil. It boasts non-hydrogenation, but I’ve never been a fan of the word “modified,” and palm oil is liquid at room temperature. Somebody messed with it, for definite. Would you like your body to be “modified” or all-natural? Remember to read the labels of any food you’re planning to consume. Did you know? 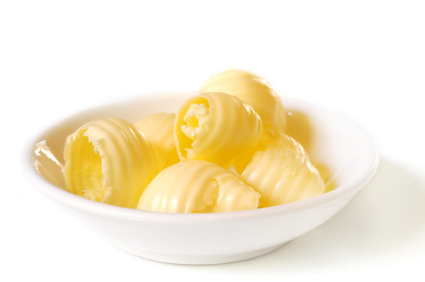 Margarine is one molecule away from being plastic! Ingredients: Canola and sunflower oils 74%, water, modified palm and palm kernel oils 6%, salt 1.8%, whey protein concentrate 1.4%, soy lecithin 0.2%, vegetable monoglycerides, potassium sorbate, vegetable colour, artificial flavour, citric acid, vitamin A palmitate, vitamin D3, alpha-tocopherol acetate (vitamin E). Q: Why is Becel Margarine a different colour in Quebec? A: In all parts of Canada, except for Quebec, margarine and butter are the same colour. In Quebec, a colour restriction law does not allow for this. In that province, most margarine is an off-white colour. Remember what happens to canola oil before it hits the shelves? This product is 74% rancid, bleached, artificially coloured vegetable oil. It contains 6% “modified” oils. It contains dairy in the form of whey protein. Milk is the #1 allergen. Humans have difficulty digesting cow’s milk, whether they are aware of it or not…and I must say that many of us are painfully aware. Monoglycerides are a common food additive used to combine two things that wouldn’t normally mix such as water and oil. Potassium sorbate is a preservative used to discourage the growth of molds and yeasts, thereby increasing shelf life. Apparently since it is used in such small quantities, there are no known adverse health effects. Comforting. Vegetable colour is a tricky one. My instincts are to say that it likely comes from Yellow dye #5 which is known to create a myriad of problems within the human body, especially known to exacerbate autism and other behavioural problems. But to be fair to Becel, it could be turmeric, which has a vibrant yellow colour, but since I think Quebec would let turmeric into their province since it is a cleansing herb…so it must be something else that Quebec’s government is afraid of, and I think we should be too! Becel contains artificial flavour. I’m not a big fan of eating anything artificial, especially if it’s there to trick my brain into thinking plastic tastes good. Vitamin A palmitate is a common pre-formed Vitamin A supplement. Better sources include apples, apricots, beets, broccoli, cantaloupe, carrots, collard greens, mango, peas, pumpkin, spinach, sweet potatoes, and winter squash. Vitamin D3. 15 minutes of sun on your hands and face will get you the same amount of vitamin D, so go for a walk and get some exercise! Go for a longer walk in the wintertime as the sun is not as vibrant then. Vitamin E. Better sources include walnut oil, sunflower oil, olive oil, (make sure all oils are cold processed) nuts (raw), sunflower seeds (raw), whole grains, and green leafy vegetables.